If you’ve ever used a diver’s mask or goggles under water, you have experienced the clarity that it brings to your vision which otherwise would be very blurry. It’s literally a window into an underwater world. But let’s suppose that you are not swimming under water nor are you inclined to stick your face in the water either. Is there a way to look under water with the same clarity without a divers mask or goggles? And for that matter, why would you want to look below the surface of the water anyway? Perhaps you want to see where the fish are hanging out under the dock for strategic fishing, or, perhaps you dropped something important overboard like your keys or fishing gear. Seeing where it is will help you retrieve it. Hopefully you have packed a Pringles potato chip can or similar clear-top cannister in your picnic basket or perhaps you can obtain one close by. You can modify this simple container into a spyglass for under water viewing. First, remove the clear plastic lid and the foil seal beneath it and empty (eat!) the contents. Then, use adhesive tape to seal the lid back onto the canister rim, making sure that it’s water-tight. Next, open the bottom with a P38 can opener or just cut it off below the metal rim. Now, invert the can so that the lid is placed into the water just below the surface while the can’s bottom is topside. 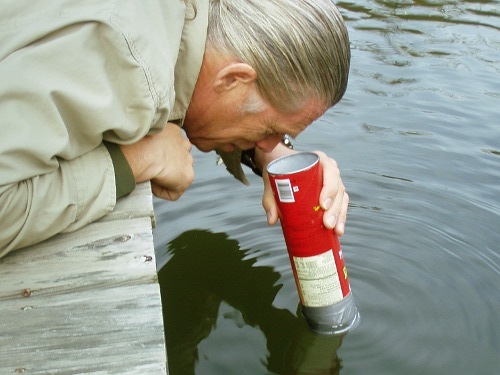 You can peer down the cannister tube and see into the water with clarity like a diver’s mask. When the water is clear and without turbidity it’s amazing to see the depth and detail of the subteranean world. 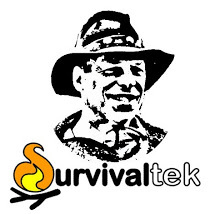 These commom materials will enable you to make this simple device for use in an impromptu or emergency situation. This entry was tagged Boating, Divers, Duct Tape, Fish, Fishing, Mask, Overboard, Spy, Tape, Vision, Water. Bookmark the permalink. This is the reason I love this site !! i dont like to fish but in a little different case you might need to see clearly to see a child who has gone over board or even one who just got away from the crowd and you are afraid they are underwater.This is a great Idea for looking for keys,fish etc but with all the flooding from hurricane sandy and others this might be a very useful and available tool thanks ! !